1934. 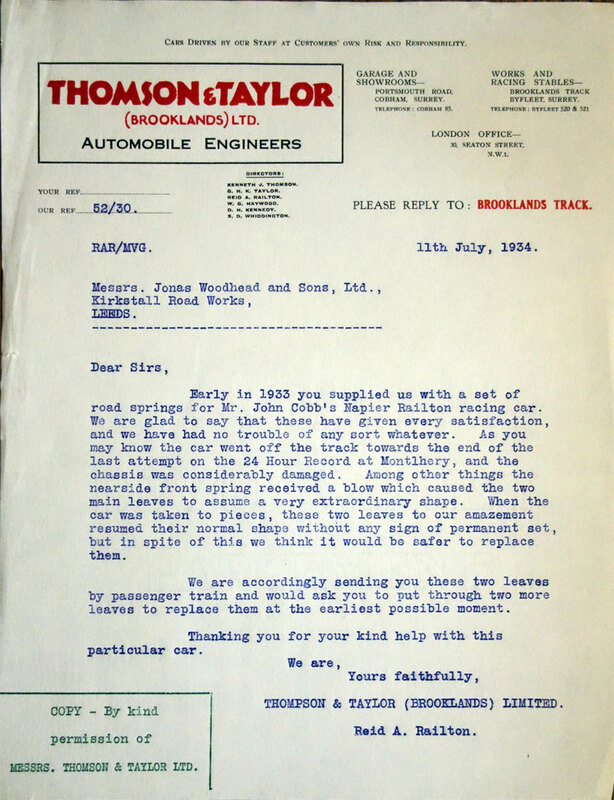 Letter written by Reid Railton when working for Thomson and Taylor (Brooklands) to Jonas Woodhead and Sons. Thomson & Taylor (Brooklands) Ltd were a motor-racing engineering and car-building firm, based within the Brooklands race track. They were active between the Wars and built several of the famous land speed record breaking cars of the day. The firm was founded as Thomas Inventions Development Co. Ltd. by J. G. Parry-Thomas and Major Ken Thomson. Their workshops were based inside the circuit at Brooklands, a convenient location for their customers, who raced at this circuit. Parry-Thomas lived next door in a bungalow named The Hermitage. After Parry-Thomas' death whilst driving Babs in 1927, Major Ken Thomson carried on, joined by Ken Taylor, under the new name of Thomson & Taylor. Reid Railton, who had previously worked for Parry-Thomas at Leyland joined them as Technical Director and chief designer. In 1926 Malcolm Campbell had opened the 'Campbell Shed' at Brooklands, trading in racing sports cars. As the name suggests, this was a simply constructed wooden shed but it grew bigger and bigger, being used to hold a barn dance in 1931. The famously impetuous Campbell lost interest though and handed it over to Thomson & Taylor. Many of his Blue Birds were later built there. The Campbell shed survives today as the home of the Brooklands museum.